So... everyone who even likes chocolate would have to agree, it&apos;s an awesome "comfort food" in times of stress... and I do so love the taste of both dark chocolate and coconut so it was a bit of a no-brainer that I was going to grab the last sample of this. With two bars to try, the obvious thing to do was eat one as-is and play with the other... but what to do for an experiment? Melting it seemed such a travesty, and trying to make something like a ganache would leave the coconut settling to the bottom... so I needed something that would keep them both combined. In the end, the simplest idea seemed to be snack balls with cashews and sultanas, plus one of these bars finely grated. I found a simple recipe online that used peanuts and raisins so it seemed easy enough to swap them out for the ingredients on hand, and after half an hour I had a good sized bowl of them. They were so tasty, and I could easily taste the coconut and dark chocolate. I made the mistake of offering a taster to a group of friends who had come over to help me move some boxes I had yet to transport to the op shop for donating, and before I realised it, they were all gone... and I hadn&apos;t taken a photo to show off my prowess, because this was the first time I had made such a treat. Still, the feedback was overwhelmingly positive from everyone, even those who weren&apos;t fans of cashews. Eating the remaining bar after they had departed seemed the prudent course of action, so I saved it for later that evening. Because today has been cooler than recent days, I broke the bar in half and put one portion in the fridge and the other I left safe from the bugs by popping it on the bench under an overturned bowl. I often find chocolate has a different taste depending on the temperature it is eaten at. I&apos;m glad I did, because there was a noticeable difference, and I actually liked it better at ambient temperature. The more subtle flavours came through as soon as the room-temp chocolate hit my tongue, whereas the refrigerated piece had a more muted, but none the less still very pleasant, flavour. Overall, these are not the cheapest chocolate bars out there, and the flavour is not even all that unique, but the quality is better than any of the bulk-market stuff you can buy these days without going to a specialist shop... and you will certainly pay similar if not higher prices there. That&apos;s the cost of fair-trade, top-quality chocolate made with care and attention to bringing out the best flavours and using only the top ingredients. There&apos;s no palm oil in these bars, and with a minimum 60% cocoa solids, the flavour is deep and rich. I would gladly buy these again, as a special treat or a token gift to someone who would appreciate and respect such quality. I think it&apos;s true what they say about your tastes in foods changing as you get older I certainly hope so in my youngest childs case as a lifetime of chicken nuggets and potato chips are probably not going to be the best. While I was younger I could not eat dark chocolate the bitterness was too much for me and it had to be milk chocolate. Changing to a lower sugar, mostly dairy free diet I started to really notice the sweetness in various foods and began to find milk chocolate far too sweet to eat a lot of while dark chocolate was such a treat and I had to restrain myself from eating a whole block. 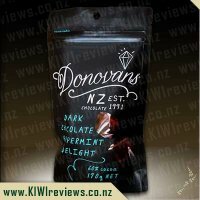 I now love the rich bitterness of a dark chocolate and get very excited when I find new products their are certainly less quality dark chocolate products out there than there are of their sweeter milky counterparts. Now coconut has to be one of my most favourite additions to chocolate and sweet dishes, not only does it deliver a refreshing nutty flavour the texture fine coconut can add makes it a whole different eating experience. 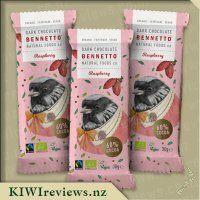 These mini bennetto coconut dark chocolate bars are no exception you get the bitterness of the dark chocolate with a satisfying coconut taste and texture. Having two bars to review was for the best in my position as the first bar I opened I ate in one sitting as it went down so well as I sat watching television after finally getting my children in bed for the night. While tempted to open the second bar I had really wanted to make a small amount of chocolate ganache for some muffins I had baked. In my eyes the dark coconut chocolate bars were perfect for a smooth ganache as the dark chocolate goes perfectly with a sweet muffin and the coconut flavour came through to add a different element also. I think these bars are actually a perfect option for me as they are probably quite a good serving size pre measured so you don&apos;t eat more than you really should in one sitting. 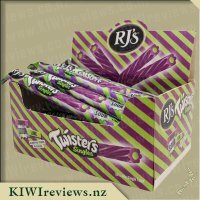 I could happily eat one of these from time to time as a adult treat and having a smaller bar would mean I didn&apos;t eat too much. With such beautiful packaging these make a great gift in a gift basket, having vegan friends these are a great option as it can be difficult finding vegan products. Very proud to support a product that stands by fair trading! 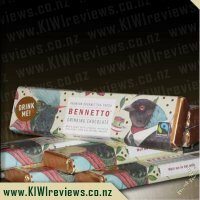 It was such a pleasant surprise to receive 2 delicious little blocks of the Bennetto Dark chocolate Coconut in my box of review goodies. My family and I have been trying our hardest to eat healthier and in a bid to do so it has meant that we have had to give up all of our favourite sweet chocolates of which mine is chocolate! With dark chocolate apparently a lot healthier than its rivals the milk and white varieties I couldn&apos;t wait to try it out, in the hopes I would find it a lot tastier than some varieties of dark chocolate I have tried in the supermarket. The first thing I noticed about the chocolate was the cute wrappers that surround it, they are just adorable with each one having a native New Zealand bird on it, which in the case of the coconut chocolate was a Kiwi. The Kiwi is wearing a suit and bow tie which Miss 5 found super funny and cute as "Kiwi&apos;s don&apos;t wear clothes". Upon opening the packet was yet another pleasant surprise the chocolate is made into 4 rectangular pieces which you simply break off and they have a gorgeous print on them of which looks to be that of cocoa beans? It was very appealing and added something special to the beautiful chocolate. Taste wise this was hands down the best dark chocolate I have ever tasted, as it was not bitter like other dark varieties are. 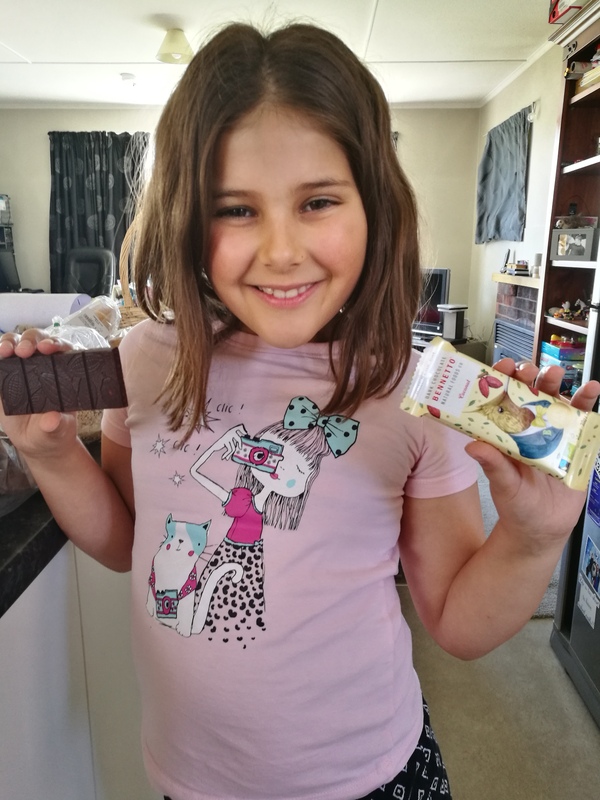 Instead it had a pleasant sweetness to it and a almost fruity/berry like flavour to it, even Miss 5 enjoyed it and she isn&apos;t usually a fan of dark chocolate. In no time at all a block of the chocolate had vanished into our bellies so with the other pack left I quickly decided to use it to top off some small bowls of avocado chocolate mousse I had earlier made. The chocolate was easy to chop and finished off our desserts nicely with the coconut being a lovely extra touch and texture. If you are looking for a healthier chocolate I recommend trying this as it&apos;s very good. 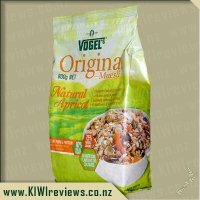 Just the right amount of coconut throughout, enough to see and taste, it is a great treat to satisfy those sugar cravings. When it comes to food my husband and I seem to be miles apart and we really don&apos;t seem to agree with anything. Where as he absolutely adored the little segment I gave him I really did not. I expected it to have more of a coconut taste to it kind of like a coconut rough but instead I found it was more dark chocolate based and only a mild flavour of coconut came thru. He could quite easily of eatten the other two segments in the 30 gram packet but I told him I was putting it away until I decided what to do with it. It has sat in the fridge for the better of two weeks and it has toyed with my husband and my girls and tonight I finally came to the conclusion I wanted a nice hot chocolate. I considered using Milo but thought I would put this to the test. So I broke up the remaining two pieces in the packet and placed them in the mug, boiled some water and added milk to it. At first I was a little worried as I looked at it and the chocolate seemed to blob on the surface so I got a spoon and gave it a good stirring I noticed I could feel no chocolate on the bottom of the mug and found that it had completely melted away. I toyed with the idea of adding Milo to it but thought would try it on its own and if too watery would re-asses as required. Sitting on the couch I took my first sip and all I can say is amazing one of the best hot chocolates I have had in a long time. If I added cream and marshmallows to the top it would top store brought versions. It was so chocolately and as a bonus every mouthful I found I was crunching down on little pieces of coconut and it was so yummy. This is what a hot chocolate should taste like. Originally I had told my husband he could have the other bar that I received but after drinking this I have told him sorry your out of luck its all mine. He asked me was it suppose to be made into a drink and I said no I just had a craving and it worked better than I could of imagined. 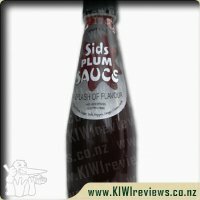 Looking at the price it is rather on the pricey side but when you take in to account how amazing it tastes in a drink and what drinks cost this is an absolute bargain. I can get two mugs for one bar of chocolate yum. Sold! 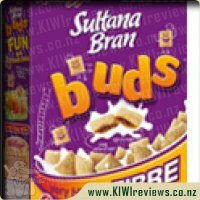 I do love the kiwi in the suit on the front of the packet. One I will be looking for again shortly. 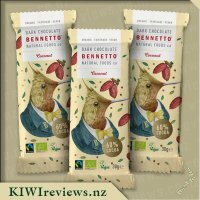 I was excited to see the Bennetto chocolate range up on KIWIreviews to possibly review, as I had just learned about them as a wee Kiwi company doing things differently, being fairtrade, organic and sustainable among other things. I requested some to try and was excited to receive the coconut and coffee bean to try. I did however, have the coconut swiped by my children almost as quickly as I opened the review box! 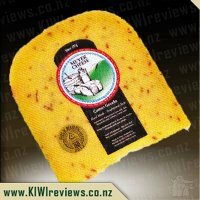 If you are interested in where products come from as I am, you will want to have a look at the Bennetto website (bennetto.co.nz) and learn a bit about the company, how and why it does things and its commitment to sustainability and having as small a footprint as possible from its products. Starting with the packaging, it is very pretty - and each bar is a different colour wrapper, with a different picture of a very fancy looking Peruvian bird on it. 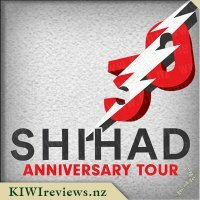 I did learn that these were painted by a kiwi artist also! It also proudly displays a vegan, organic and fair trade logo, that is easy to spot and recognise. The packaging is easy to open, and is a bit sticky along the join - in a good way, meaning if you do not eat all pieces at once, you can push it back together with the chocolate inside. Unfortunately, with 3 children wanting to try it - this was never going to happen!. There are 4 pieces in easy to snap off bits, with a total of about 30g. The chocolate is a beautiful dark chocolate - having 60% cocoa, and the a nice amount of coconut in there as well. The coconut is more like flakes that desiccated, meaning there is a slight crunch to it. I am a huge coconut fan myself - and personally felt the stronger taste was the dark chocolate, and would have liked it more coconut-y - but, my husband (who I shared the second bar I received with) and my children said it was perfect - so it really depends on the person I guess! The one small negative for me is the price, but, in saying that, I feel this is more of a special occasion chocolate than an everyday type one, and in that way would be perfect as a little thank you, in a gift basket, for new parents, and people you love. Definitely a good option for teachers at Christmas time too - maybe pairing it with a wine glass and wee bottle, or a mug and coffee sachet. 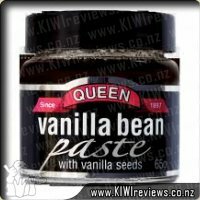 I have already looked at ordering more of these - there are a few more flavours that sound amazing. 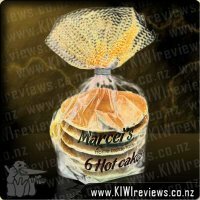 I honestly can say these are delicious, and I will be buying some as treats for my clients in the new year. I have always loved chocolate for as long as I can remember, my friends also know this and it is very rare for me to have a birthday and not receive something chocolatey as a gift. I find some brands taste better than others and would happily pay extra for quality taste. 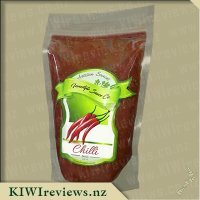 While browsing the KIWIreviews website a couple of the products available to request caught my eye - however I wasn&apos;t sure what they were until I clicked on them. 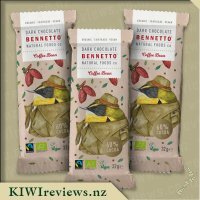 The eye-catching products belonged to a company called Bennetto Natural Foods Co, and these were some different flavoured dark chocolate mini bars. I requested a couple and eagerly awaited to see if I had been chosen. When I opened my review package I decided to try the Dark Chocolate Coconut flavoured bar. The bar is 30g and was wrapped in a foil packet with a cute looking bird dressed in clothes and some red flowers. This chocolate has a lot going for it including that it is 60% cocoa, organic fair-trade, and vegan, this item is produced in Switzerland. I unwrapped the foil and was impressed with the darkness and smoothness of the chocolate, I proceeded to snap a piece off and tasted it. The texture was smooth and melted quickly, there was a definite coconut flavour but I feel it was quite subtle compared to the dark chocolate, which was a shame as I love coconut. However this of course did not stop me from demolishing the rest of the chocolate bar, while finishing the last piece I was busy contemplating how I was going to use the other bar of chocolate. Finally I decided that I would make a batch of vanilla cupcakes and sprinkle the chocolate over the top after it had been finely chopped. I waited for the cupcakes to cool down and then iced them with a vanilla buttercream, next I sprinkled a generous amount of the coconut dark chocolate on top. 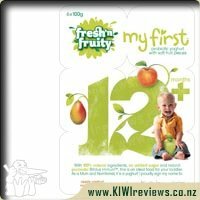 I found the flavour combination was delightful, needless to say they were a hit with my three children. I would recommend this product to lovers of quality dark chocolate, this is worth the price, and the packaging makes it appealing to give as a little gift. 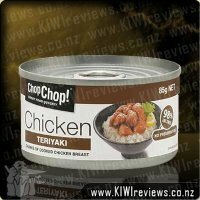 However, I do not think that I will purchase this for myself personally, not enough coconut flavour for my taste-buds. I look forward to trying the other flavours available from the Bennetto Natural Foods Co.